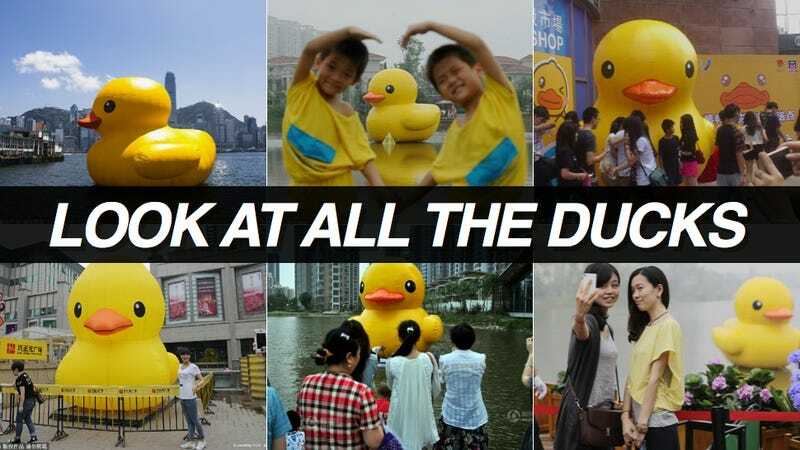 The world-famous Rubber Duck art installation is spawning a slew of imitators in China. This weekend, at least ten fake ducks appeared across the country in what could only be called a quack up. Dutch artist Florentijn Hofman created the original 54-foot-tall inflatable sculpture, which has been displayed in Amsterdam, Osaka, Sydney, and more recently, Hong Kong. The sculpture will be displayed until June 9 in Hong Kong, where it has received considerable media attention. Cities in China seem to long for giant rubber ducks of their own, and on June 1, which was Children's Day, a whole bunch of knock-offs appeared in China. This one in Dongguan is the best fake rubber duck. While Hofman is responsible for the original Rubber Duck, the knock-offs were created by construction companies or real estate companies as publicity stunts. Traditionally, ducks apparently have nothing to do with Children's Day in China. However, with the recent popularity of the Rubber Duck in Hong Kong, the day seemed as good as for a fleet of giant inflatable ducks. Then again, when isn't a good day for that?